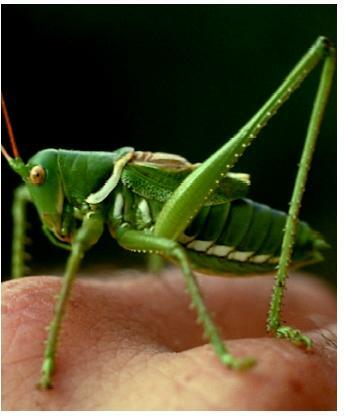 A katydid. Insects are distinguished by having three major body segments (head, thorax, and abdomen), with three pairs of legs attached to the thorax. distances. Chemoreceptors are also located on the feet, allowing an insect to taste its food as it walks across a leaf or a table. The numerous hairs covering the insect body are linked to mechanoreceptors, which aid its sense of touch. Some mechanoreceptors can sense changes in air pressure, useful for flying or evading a swooping predator. Receptors for carbon dioxide, water, and temperature also exist. Insects are the most diverse of all groups of organisms, with over 800,000 species named and many thousands, probably millions, yet to be discovered. Insect diversity may be linked to their close association with the angiosperms (flowering plants). The Coleoptera (beetles) are the most diverse of all insect orders, with at least 350,000 species, representing one fourth of all known animal species. (Asked what could be inferred about the work of the Creator from a study of His works, British scientist J. B. S. Haldane is reported to have quipped, "an inordinate fondness for beetles.") The evolutionary reasons for the mind-boggling diversity of this single order are not clear. Other major orders of insects include the Diptera (flies), Hymenoptera (bees and wasps), Hemiptera (true bugs), and Lepidoptera (moths and butterflies). Note that each name describes the wing ( ptera means "wing"). For instance, Diptera means "two wings," referring to the presence of only one wing pair in this order. In the Coleoptera ("sheath wings"), the first pair of wings is modified into a hard covering for the rear pair, which is easily observed in a lady beetle, for instance.